The potter's wheel is a machine used in the shaping of round ceramic wares. Occasionally, it is also known as a "potter's lathe," however this is actually a different machine used for a shaping process—or turning—which is similar to shaping metal and wood pieces. The potter's wheel may also be used during the process of trimming excess clay from dried wares and for applying incised decoration or rings of color. 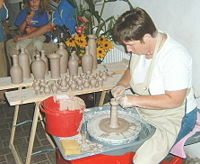 The techniques of jiggering and jolleying can be seen as an extension of the potters wheel. In jiggering, a shaped tool is slowly brought down onto a plastic (semi-dried) clay body that sits atop a rotating plaster mold. The jigger tool shapes the top face as it molds the underneath one. The term is specific to shaping of flatware. 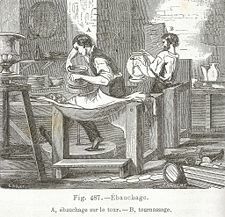 A similar technique, jolleying, refers to the production of holloware: Cups or bowls (having a symmetrical, hollow center). 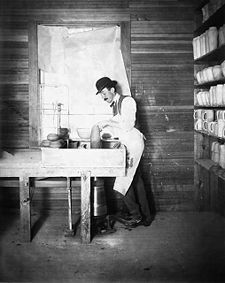 A potter molds pottery with his hands while operating the mechanical potter's wheel with his foot, 1902. 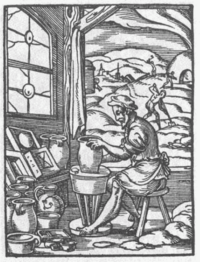 Many early ceramics were hand-built using a simple coiling technique in which the clay body was rolled into long coils that were then pinched and beaten together to form the body of a vessel. The artist had to turn the vessel around in order to wind the coils along the top of the piece, increasing its height with every complete turn. In the coiling method of construction, all of the energy required to form the piece is supplied directly by the hands of the potter. This changed with the introduction of the potter's wheel. The heavy stone wheel was initially kicked or turned with a stick, and then continued to turn based on its own momentum. In wheel-throwing, the bulk of the energy used does not come directly from the hands of the potter but from the turning wheel. The introduction of the potter's wheel brought benefits in the form of speed, symmetrical shape, and efficiency, as a job that might have taken hours or even days to complete was reduced to one that could be done, with practice, in minutes. Early ceramics built by the coiling technique were often placed on mats or large leaves to allow them to be worked and turned more conveniently. This arrangement allowed the potter to turn the mat rather than walk around the vessel to add coils to the clay body. It has been theorized that the earliest forms of the potter's wheel were developed as an extension to this procedure. The earliest wheels were thus probably turned slowly by hand or by foot while coiling a pot, but later developments allowed energy in the momentum of a kick wheel to be used to speed up the process of throwing. The relatively unrestricted momentum of the kick wheel enabled more efficient use of the potter's energy. It is not known when the potter's wheel first came into use, but dates between about 6,000 B.C.E. to about 2,400 B.C.E. have been suggested. Many modern scholars suggest that it was first developed in Mesopotamia, although Egypt and China have also been claimed as possible places of origin. A stone potter's wheel found at the Mesopotamian city of Ur, in modern-day Iraq, has been dated to about 3,000 B.C.E., but fragments of wheel-thrown pottery of an even earlier date have been recovered in the same area. By the time of the early civilizations of the Bronze Age, the use of the potter's wheel had become widespread. In the Iron Age, the potter's wheel in common use had a turning platform about a meter above the floor, connected by a long axle to a heavy wheel at ground level. This arrangement allowed the potter to keep the turning-wheel rotating by kicking the wheel with the foot, leaving both hands free for manipulating the vessel under construction. Use of the potter's wheel became widespread throughout the Old World, but was unknown in the Pre-Columbian New World, where pottery was hand-made by methods that included coiling and beating. 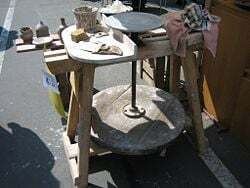 The use of the motor-driven wheel has become common in modern times, particularly with craft potters and educational institutions, although human-powered ones are still in use and are preferred by some potters. A simple animation of throwing on a potters wheel. Pull up sides by crossing wet thumbs at the top with fingers on either side of the wall and slowly, slowly pulling up. In Ancient Egyptian mythology, the god Chnum was depicted as forming the first humans on a potter's wheel. Ancient potters often used a stick to rotate the wheel, or an apprentice or servant would use the stick to turn the wheel as the artisan worked. The simplest way to spin the potter's wheel by foot is to sweep the foot from one side to the other against the spinning hub causing it to turn in one direction. From an ergonomic standpoint, this is rather awkward as only one leg is used in this process, much like driving a car using only the right foot, causing an imbalance in the muscles of the body. Yet the rhythm of the wheel turning on the kick wheel is an integral part of the balance and throwing of the pot, many weekend potters still use the traditional kick wheel for throwing clay for its link to early potters. Another solution which was invented at an unknown time was to have a crankshaft with a lever, that converts up and down motion into rotary motion. Sewing machines such as those pioneered by the Singer Corporation have manual models operated by this method. Modern potters tend to use the electric style of wheel, as it gives consistent turning with little effort. Most wheels have several speeds at which to work, usually the foot presses down on an "accelerator" or foot plate to control the speed of the wheel head. Electric wheels also tend to be smaller than kick wheels. Electric wheels need only a small stool or other place to sit to work on the wheel. Additional parts may be added, such as a shelf for tools, water, sponges, and so on. Different heads may be added to some of the electric wheels, making it easy to just add a new head and continue throwing while the previous pot dries on the last head. For wheels without interchangeable heads, a small bat may be attached to the wheel head with bolts or just several balls of clay. However, the contemporary kick wheel is still a favorite for some potters who shun the electric wheel's mechanized feel and somewhat noisy electric motors. The kick wheel also allows the potter to feel more of the rhythm of creation of a pot and the silence of the kick wheel allows a more "zen" sense of consciousness for the potter. Childe, V. G. Man Makes Himself. London: Watts & Co, 1951. Hopper, Robin. Advanced Throwing on the Potters Wheel Extended and Altered Forms. DVD video, 1995. Kirkpatrick, Christian. "Potteries of Staffordshire." British Heritage. Retrieved September 4, 2007. Utz, George Jacob. The Potters Wheel from Past to Present. Dissertation: Thesis (M.F.A. )—Ohio State University, 1972. The Origins of the Potter's Wheel multi-page article on Ceramics Today site. www.ceramicstoday.com. This page was last modified on 27 May 2015, at 20:50.